Airbnb is known for its core philosophy of connecting people and culture by providing a residential-space sharing platform. However, through the interview and data exploration, we noticed a drastic gap between the ratio of the Entire Home listings and Shared Room listings. "When using Airbnb, I want the most localized experience possible. But it has been getting harder and harder..."
We wanted to create a trend-exploration tool in helping people efficiently constructing their travel experience & encourages the participation into the sharing economy. If you are a traveller who is looking for the most immersive local experience with the best value, AirbnbShare is for you. We interviewed 6 participants to learn about their Airbnb experience, and what they are curious about Airbnb dataset. The interview findings lead us to 2 types of potential users: travellers who wants to live like locals, and general investors. Through further market research, we found many existing tools that have already coved the most needs of general investors, while the topic of "Immersive Trip" is barely touched. The interesting gap led us to look at the sharing culture behind the data in LA. Following the research, we began sketching and designing our first iteration following Five Design Sheets guidelines. The initial paper prototype concept contained a dashboard of 3 different kinds of visualizations: a map of all listings by Los Angeles neighbourhoods, a circle of the distribution of different type of room by each neighbourhood, a chart of the comparison of sale price and Airbnb price by neighbourhoods. After this in-class evaluation, we found that a several of these visualizations were difficult for viewers to understand and explain. In addition, too many filters actually confused the users, and prevented users from exploring these visualizations. We conducted in-person usability tests for our second prototype. We gave 3 participants (2 male, 1 female) a contextual scenario and asked them to think aloud while they are completing the four tasks through the low-fidelity prototype. We incorporated the map, bar chart and parallel coordinate into our low-fidelity prototype, and these three interactive visualizations provided users with more information, including the Airbnbâ€™s price vs long-term lease. 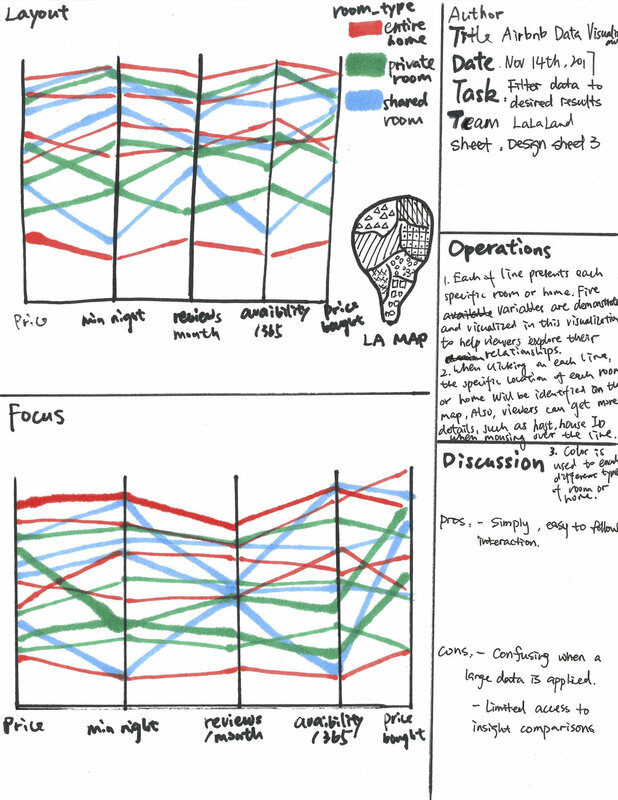 The third prototype attempted to accommodate all of the design recommendations from User Test Round 2, and created four different kinds of visualizations. We used scatter plots instead of bar charts to present the comparison between Airbnb price and monthly rental price, allowing users to understand the positive correlation between these two variables. We replaced the Parallel Coordinate with the bar chart to indicate Airbnb price as well as the number of listings among different neighbourhoods.